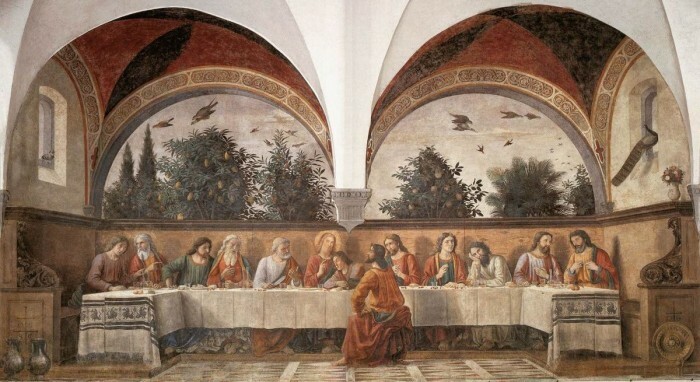 Although the most famous Last Supper painting is that by Leonardo in Milan, the phenomenon of large frescoes of the topic in monastic refectories is actually a characteristically Florentine Renaissance one. 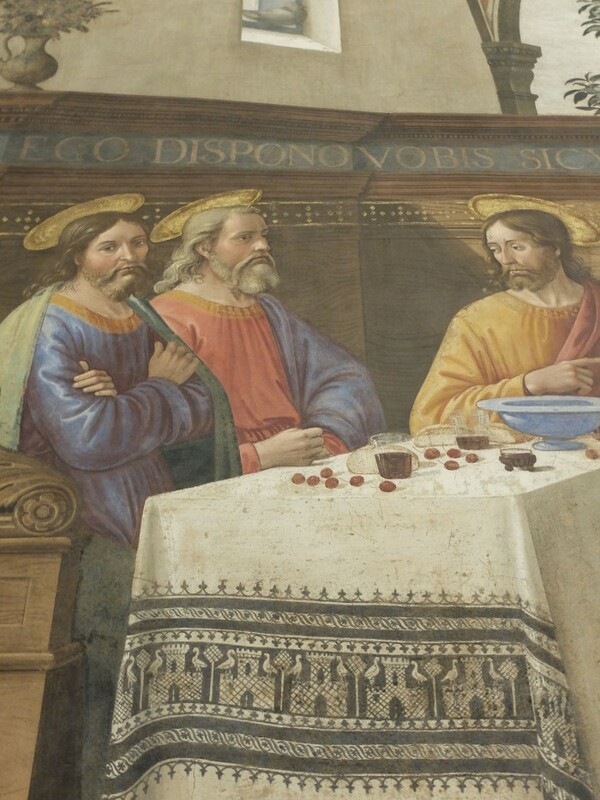 In Florence this summer is an extraordinary opportunity to dine in the locations of three Last Supper paintings from the Renaissance era, on the occasion of Expo 2015 in Milan, a nice way to tie together this artistic connection between the two cities. The whole country has planned events in honour of the world exposition and its theme, “Feeding the planet.” Orti e Cenacoli is one such event: a series of five very special dinners organized by the local Camera di Commercio and carried out by PromoFirenze, special agency of the Chamber of Commerce, with Grassi+Partners PR. 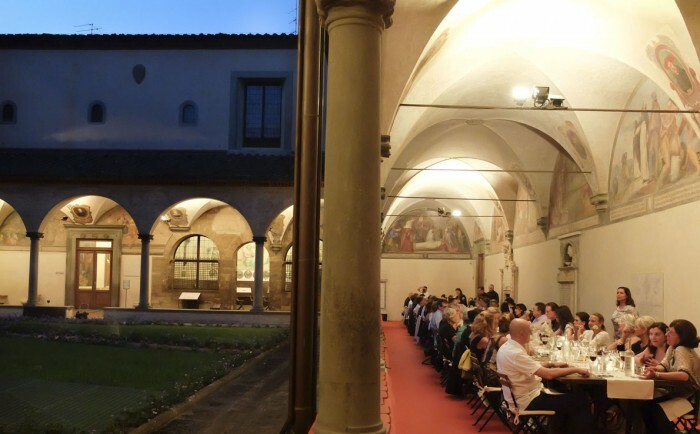 Events are held in the courtyards of monastic institutions with Last Supper paintings. The menus are developed by talented guest chefs with ingredients that are part of a local sustainable project. 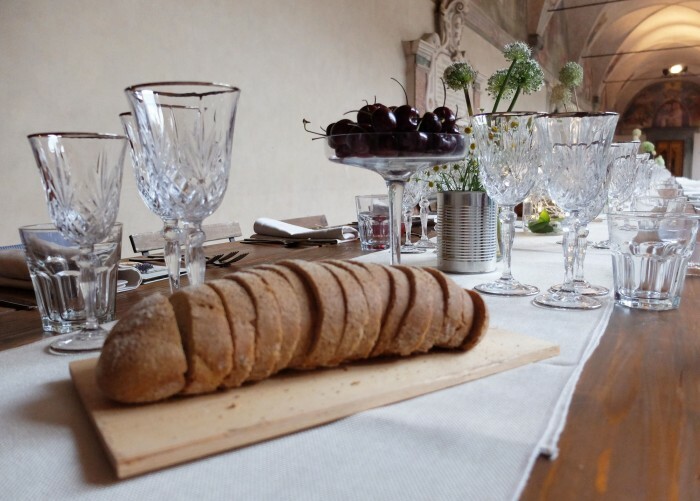 Each meal is preceded by an opportunity for a private visit of the location, either with a guide or on your own. The initiative intends to provoke reflection on themes like agricultural sustainability and the sacred significance of dining as a union of art, nature and conviviality. Let’s take a look at the three locations of the dinners and some photos from the meals held there. Three dates remain, through September 2015, and are listed below. Andrea Orcagna painted a Last Supper with a large Crucifixion scene above it in the refectory of Santo Spirito in the 1360s. Sadly not well conserved, only the edges remain as the wall was opened up for a doorway. 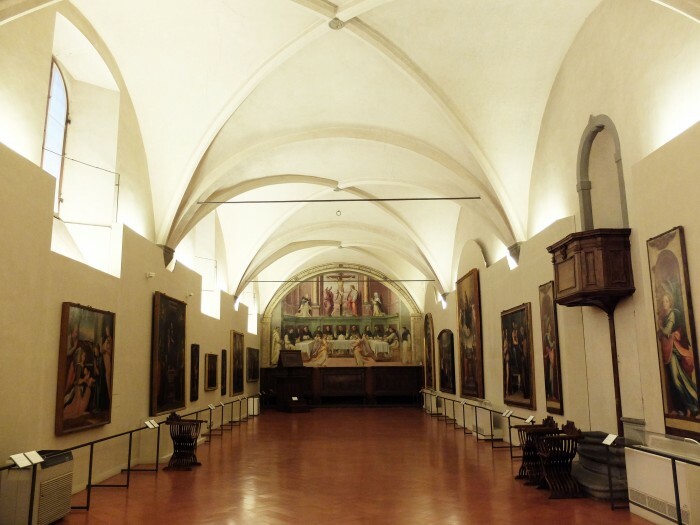 The room now houses the Fondazione Salvatore Romano, the eclectic collection (from the Romans to the 17th century) of antiquarian Salvatore Romano, donated to the City of Florence in 1946. 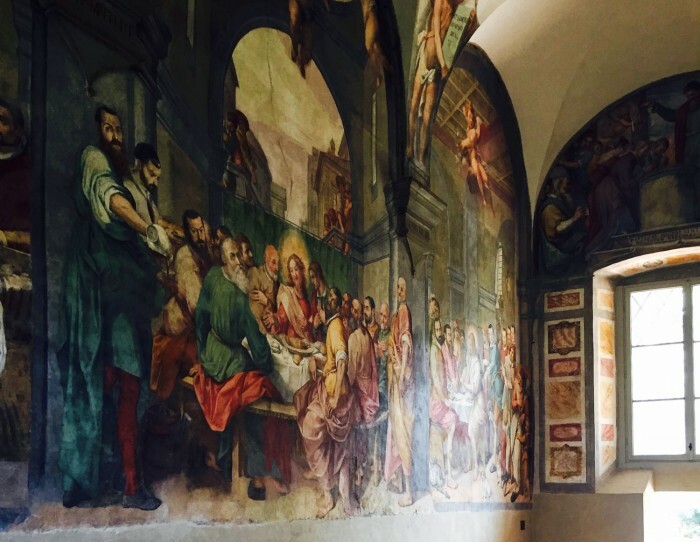 Another refectory – called Refettorio Nuovo – contains a later Last Supper by Bernardo Poccetti from the 16th century. This is in the part of the convent managed by the Agostinians and not normally open to the public, an aspect that makes dining here and visiting this space extremely special. The Church of Santo Spirito, designed by Brunelleschi but heavily modified after his death, houses a crucifix attributed to Michelangelo, as well as numerous altarpieces from the 15th and 16th centuries by the school of Ghirlandaio, Filippino Lippi and others. 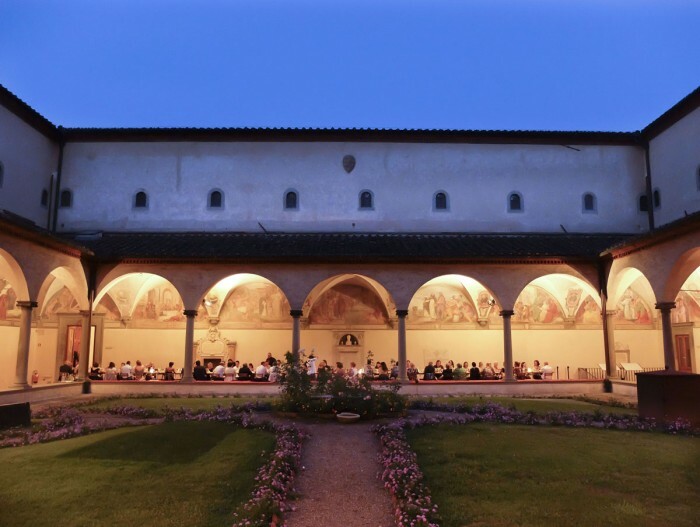 I’ve never actually visited the courtyard of this church (it’s closed to the public), in which the Orti e Cenacoli dinner was held on June 11 – but from this photo it looks like it would be worth discovering! The Last Supper in this refectory is a beautiful work by Domenico Ghirlandaio in 1480. The room’s arches are illusionistically incorporated into the background of the painting, which seems to open up into a garden or landscape containing fruit trees and birds, most of which allude to Christ, paradise, martyrdom etc. In the foreground, the table with Christ and his apostles (and Judas on the other side) is set with a beautiful embroidered tablecloth that looks like it had been just ironed and unfolded. The “alla Perugina” style of embroidery contains symbols of salvation, sin and Paradise in the various fruits and vegetables represented. The decorative items like the metal plate at the right and the pitchers at the left would have been common to the prestigious contemporary households from which many of the religious men here came. The church of Ognissanti is also famous for housing a beautiful Crucifix by Giotto, recently restored, and a fragment of a painting by Botticelli. 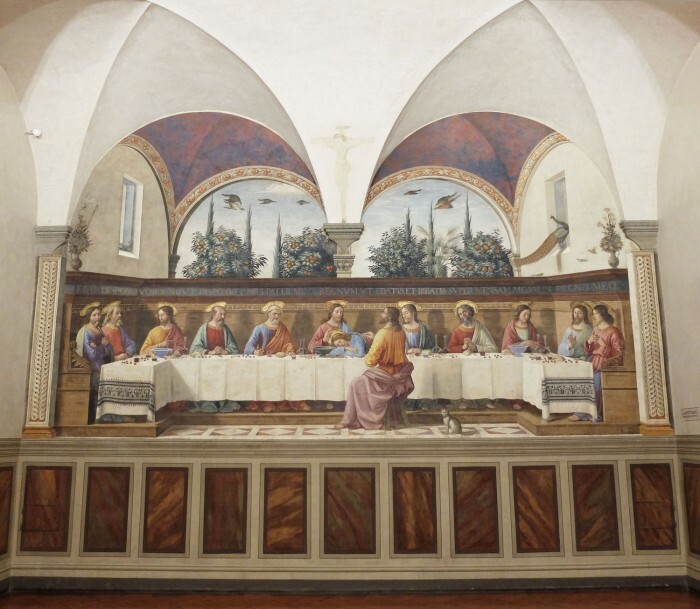 A small dining room at San Marco, likely used for guests rather than for the entire monastic community, contains a perfectly preserved fresco by Domenico Ghirlandaio that is almost a carbon copy, on a smaller scale, of the one at Ognissanti. The significance of the tablecloth decorations and items present is the same. A larger refectory is also present, with a work that looks a lot like a Last Supper but is actually a “Cena miracolosa di San Domenico e Crocifissione tra Santa Caterina da Siena e Sant’Antonino” by Giovanni Antonio Sogliani (1536). The Orti e Cenacoli dinners are my idea of heaven. I’m a fan of modern Italian cuisine and of the use of natural ingredients. Many of the vegetables used in this project were grown in an urban garden planted last December by teachers and students of the Florence Agricultural Institution and located adjacent to Villa Bardini. Tending the garden was in part the job of twelve of high school students with learning disabilities or difficult situations, a large number of whom graduated this year and who benefited muchly from the experiment. The chefs participating in the project are Michelin starred Marco Stabile (Ora d’Aria, Florence), Maria Probst (La Tenda Rossa, Cerbaia), Filippo Saporito (La Leggenda dei Frati, Florence), Entiana Osmenzaza (Sesto on Arno, Florence) and Luca Landi (Lunasia, Tirrenia/Viareggio). The menus they prepare are based on the items grown in the urban garden as well as sourcing local, often unusual ingredients, like the “coniglio verde leporino di Viterbo” that was prepared in perfect fried bites by Probst for the meal I attended at San Marco. Each night includes an aperitivo, an amuse-bouche, primo, secondo and dessert, accompanied by wines provided by local wineries. 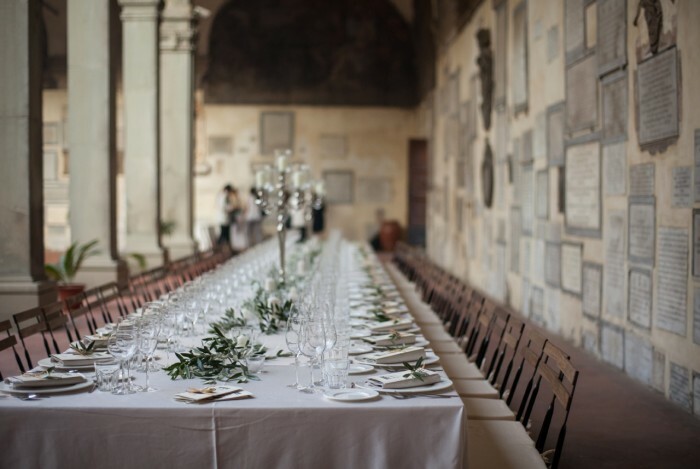 The long, convivial table set up in the historic courtyard (with appropriate floor coverings to protect the art and architecture) are refined wooden boards on A-frames, imitating many of the historic tables pictured in the Renaissance frescoes. 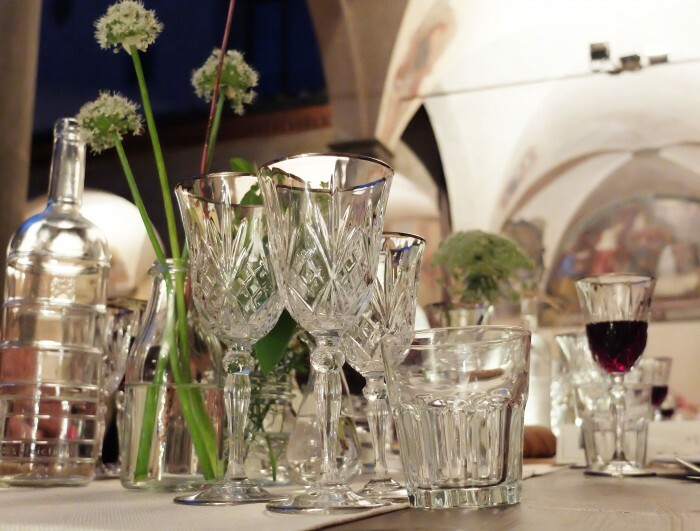 A long linen runner is punctuated by fine glassware, lighting and decorative items. At Santo Spirito, olive branches were strewn on the table, while at San Marco, bowls of cherries and loaves of bread imitated those found in the fresco by Ghirlandaio.